Some people say that rain on a wedding day is a good sign; it is harder to untie a wet knot. You probably do not share that sentiment if you are planning an outdoor ceremony. 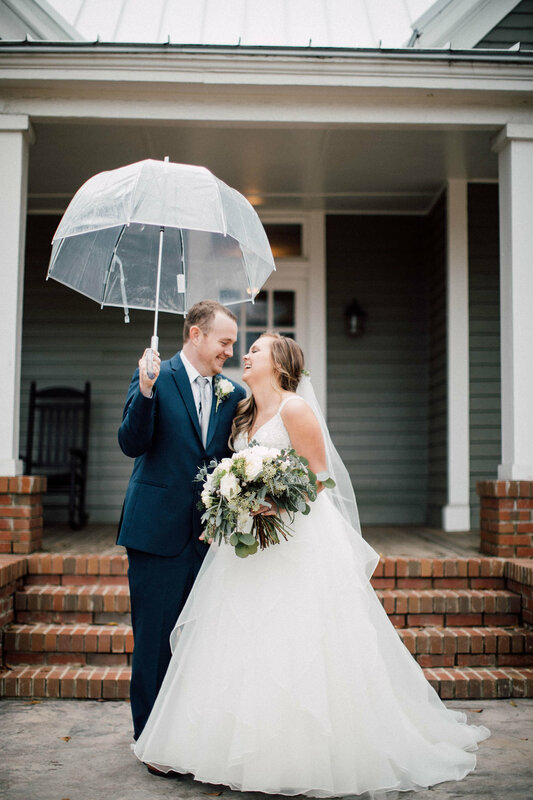 Weather can be one of the biggest stressors when planning a wedding and one of the hardest things to anticipate with our crazy Georgia weather. One thing you should always, always ask about before you book a venue is their rain plan! Regardless of whether a cold front or a hurricane blows through, you need to make sure that your venue has an adequate plan to keep your guests comfortable and safe. We never hope for rain, and fact is, that the vast majority of our couples who want an outdoor ceremony, get it! But if weather does turn for the worse, we have got your back! So, what is our “plan B” for less than desirable weather? Glad you asked! Plan A is always determined by our couples. We can accommodate inside and outside ceremonies but most of our couples choose to hold their ceremony outside. If you are hoping for an outdoor ceremony under our stunning pecan tree then that is your plan A! Your “plan B” is decided on at your final meeting 30 days from your wedding. We have two options in case of rain. Both options ensure that you and your guests stay comfortable and dry. The first plan is our most popular rain plan because it allows for the most flexibility. This plan involves an indoor ceremony with reception-style seating. We set rows of chairs up front for your immediate family and the rest of your guests sit at their tables for the ceremony. Once the ceremony is over and you & your wedding party exits, your aisle turns into your dance floor and everyone is ready to party! No moving of tables or guests required. This option is so popular because you don’t have to make the final call on inside or outside until the morning of your wedding. If you were planning on reception style seating but your wedding day arrives bringing unexpected blue skies, it is easy to make minor adjustments and still have an outdoor ceremony! This rain plan involves us setting up a full, traditional ceremony inside the barn. After the ceremony, guests exit and our staff flips the barn into your reception space. We pull up all of the chairs, sweep any debris and then set and decorate all of your reception tables. With this rain plan, you have to make the final call on inside vs outside one week before you wedding and if the weather changes there is no going back. Because the set up is more intensive, we are not able to make day of changes to a full-flip ceremony plan. This option is also slightly more expensive. There is a fee to cover the extra staff that is required to tear down and then reset the barn and depending on your guest count, you may have to provide a tent to keep guests dry while we are inside flipping the space. About one week out from your wedding we begin checking the weather. (We are really checking almost a month out, just like you, but any further out than one week is not accurate. Don’t sweat it yet if it is calling for rain a few weeks out.) We are then ready to put the plan you choose into action and make sure that we are prepared and ready for a smooth and stress-free wedding day, regardless of weather. Indoor ceremonies are beautiful, intimate and because of our climate controlled barn, comfortable for everyone. Rain may not be welcomed on your wedding day, but if it does decide to pop in your wedding will still be beautiful and memorable. We have a fool-proof system that will ensure your day is stress-free regardless of your ceremony being inside or outside. Plus there is good news! Even if Mother Nature decides to shower you with love on your wedding day and your ceremony is going to be indoors, there is almost always a break in the rain for outdoor pictures. Sometimes that includes pretty umbrellas or our front porch, but you will be able to get those pictures outside!